There is such a richness to be uncovered here in Brick Lane, and I fail to uncover it in this post. I just collected a few quotes I particularly liked about life in London…that’s what you get, reading for enjoyment. I did enjoy this exploration of immigration and grappling with culture as they intertwine with character and expectations, and of course, the city itself. I loved its focus on women’s experience, enjoyed Nazneen’s attainment of strength and freedom, how it compares to her sister’s, how it connects to politics and race and self and place. I remember first coming to the city from the desert — nothing like a village full of verdant green, but still this critical view of the East End strikes a chord. Of course, I moved to L.A. first, the bits with far fewer parks and green spaces, so it’s harder to be so critical of London in face of that sprawling concrete disaster (much as I love so much of it). That said, I have seen a number of these Tenant Association halls, and they really are entirely dire. I always wondered about that. They, more than anything else, show that estates weren’t always built with the most respect for the people they were to house. Many were, of course, but not these perhaps. Even so they contain so much life, friendships that matter, families and tragedies and love and plans for the future and organising for better or for worse. The stairs are steep in the mansions, and the trash chutes are almost always overflowing. Small windows and doors. Small impersonal tiles like hospitals and prisons. Thin walls that allow you to hear everything. The smell of urine. Children everywhere. Those things that are so hard to find in private rentals, in shared flats, in uncertain tenancies where you never know what will happen next, when you will be out, what your crazy flatmate might do. Where it is hard to find space of your own. The terrible thing is that many council flats did not bring such things in the end; this one didn’t. Everyone who knew anything warned her to wait for a flat in a better building. You watch this living situation move Adah further and further from each of these three objectives she prizes so greatly, above all stealing away her independence and drive through the demands and requirements placed on her by the Family Advisor. God, you want to hit that woman sometimes. Carol, you think, and shake your head. The tenants know as well as the readers that she lives off of ‘helping’ them, and she’s not one to help herself out of a job. The remote possibility remains that she does at bottom have people’s best interests at heart, but she still kills just as dead each possible future but the one in which you just get by through a begrudged kindness from the State, with her help of course. Despite all of that, the Mansions has its own community, its own support. There is a warmth there, a camaraderie. There is something to miss after everyone is moved along and it is demolished. We always leave a piece of ourselves behind in the places we have lived and the people we have shared our lives with. While writing this I was comparing the Mansions with Haggerston Estate in my mind, also considered a problem estate for problem people from the very beginning. I was wondering what might have grown in the Mansions if people had been allowed to come together, to do for themselves, to take ownership of the space, to dream and plan and paint. You see sparks of resistance here and there, of course, it is curious the different extents to which Adah’s fellow tenants have internalised both the rules and the disrespectful attitudes behind them. Curious where they make their stands. But make their stands they do. We need social housing that does not through its patronising control of the poor create such conditions, that provides the infrastructure instead to support and nurture the human lives within it. That ensures the Carols of the world are employed in jobs they are actually good at where they can do no damage. Estate: A Reverie has some of the answers. Of course, we also have to build more, and better social housing. And stop destroying what we have. Emecheta is showing here both what housing could mean to a mother trying to achieve a better life, and the gap between that wonderful possibility and a controlling reality of rules and requirements that denies that achievement. This film has been so long in coming, and I have been there for a small piece of its journey. It has been an honour. A wondrous thing. I had passed other estates with windows boarded up yet signs that people still clearly lived in them. This left me both angered and confused, as housing is in such short supply for us, and this is our housing standing empty. These are homes that people love in the midst of desolation. Here I could tell someone was fighting back, ensuring they were visible and not simply to be silently swept away. I met Andrea Luka Zimmerman and Lasse Johannson (part of Fugitive Images, those who had put up these pictures with fellow residents) a few months later, the three of us on a panel put together by This is Not a Gateway at the Tate Modern (the Tate Modern! I called home, ever so proud). This photo installation, i am here, was only the first part of a longer exploration of the process of decanting an estate against its resident’s wishes. 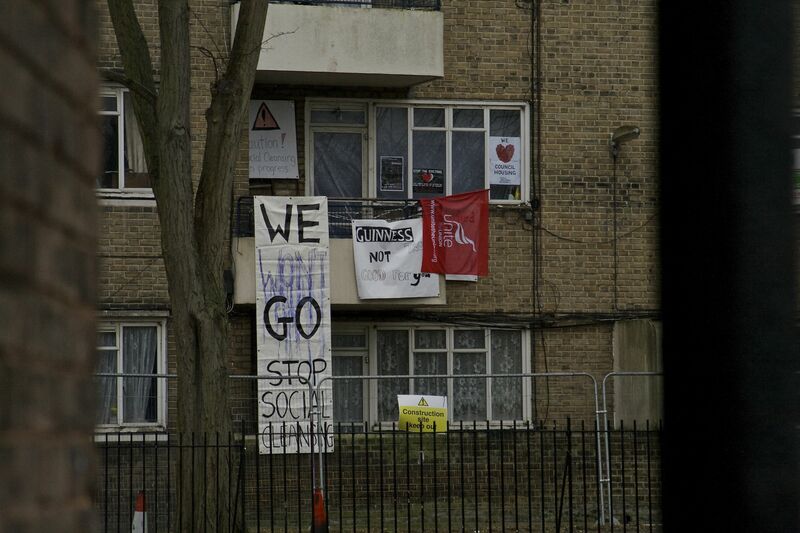 This, a protest against the estate’s abandonment in preparation for regeneration. It sat alongside endless meetings, letters, petitions, protests, lobbies to preserve and improve the housing for those who lived there and loved it. The second was the book, Estate, a combination of personal essays, photographs, and political-economic contextualization. I loved it. You can buy it here, from Myrdle Court Press. Built in 1848 and housed within the Polytechnic Institution on London’s Regent Street, the cinema was the first in the country to show moving pictures. In 1896, the cinema showcased the Lumière brothers’ Cinématographe to a paying audience, and, as the curtain fell, British cinema was born. I had seen various versions of the film — in snippets, and bits of pieces. A work in progress. But I wasn’t prepared for the full feature. Inspiring and heartbreaking both, it does two things wondrously well. It shows the residents as they were, neighbours getting to know each other, the ways they had chosen to decorate their rooms, children playing and growing up, a father and daughter being forced to move, the elderly over time as they grew sicker and sicker. It is the most honest view of Parkinson’s I have ever seen. It brings the people of Haggerston Estate into your heart and they will never leave it. It does not does this with a bright and clinical gaze, but with the warm compassion of someone who has shared space with them for fifteen years. That sees people as they are for good and bad, and thus can love them truly. You know exactly what suffering the lack of repairs has caused and what the loss of this community will mean. Something planners and housing managers and city officials somehow never understand. This film could only have been made by someone who had lived there, fought for it, loved it. That is why it captures the magic that also happened here. Slated for regeneration, the council stopped caring what people did here. Relaxed the patronising and controlling sets of rules that controlled behaviour. You hear a woman recount a story of her grandfather moved here when the estate first opened from the slums. Removed from his home and patch of ground and his animals, when they tried to force him to get rid of his dog too, he gassed both of them in the apartment. This film is full of dogs. It is full of colour. People didn’t run riot, they painted logs and made seats, they painted goal posts on the wall for the next-door kids, they planted flowers and vegetables. They had barbeques and built a fire pit and sang songs to welcome in the New Year. They helped each other. They told stories. They put on regency dress and discussed and acted out Samuel Richardson’s novels, whose heroines provide the names for the estate’s buildings. Councils never did quite figure out that poor people weren’t the enemy, and the slums weren’t their creation, did they. But oh, the things people on estates can build when left alone to come together as a community. She highlighted that this was a film of all the things unseen, to explore what it meant to lose the place after so many years fighting to get repairs. She felt they had to do something after the financial crash, seeing the posters go up everywhere about benefit fraud with slogans like ‘we are coming to get you.’ The strong feeling that something must be done to challenge this image production that blamed everything on the poor who were least to blame. This was always a collective effort. She talked too about the transition period where they could do anything they wanted, a time when people were able to take the space and decorate it as they wanted, and it became a magical place. There were some questions about why this film didn’t show struggle, the fight to improve it and keep it. Hard choices were made on this, footage exists of everything, but there are so many films of struggle, it is something we understand (even if we don’t yet know how to win — but that is my own aside). She chose instead to show the reality of people’s lives, explore not just what the estate and its loss meant to them, but what they were able to create there when allowed some freedom for creation. (In a previous cut, I remember seeing people come back to the estate who had already moved on, bursting into floods of tears at seeing their old flats, torn in half between all the frustrations of living somewhere in such terrible conditions but also all of the memories that still made that space a home. It was so powerful but Andrea is right, it did not fit here). She talked about the architecture, about how vilified it is yet in these passages in the sky you have to meet your neighbours, you see them every day, you say hello. New buildings are secure by design, you never see anyone, community cannot grow and people are lonely in them. Something else we are losing. We still have a great deal of public space, it is important in this country, but home is still seen as private, insular. It’s an interesting observation. Early estates were built to try and help create community, with multiple shared spaces — perhaps not public space but community space. That is something that is disappearing, and surely we are losing something with it. There is so much to think about here, the film so rich it will reward reviewing. Go see it. Why block the budget? Why protest? The strategy also aims to make sure that the homes we build better reward those who work hard to make this city a success – by massively increasing opportunities for home ownership, by improving the private rented sector and by ensuring working Londoners have priority for low cost affordable homes to rent. Back to discourse of the ‘deserving’, and the delusions that more than a fraction of ‘hard working’ Londoners will ever be able to afford a home here. Back to delusions that the private market has ever provided quality housing for the mass of working people. Look at the Royal Mail building fiasco at Mount Pleasant, with ‘affordable’ flats at £2800 a month. They put up with broken and defective grates which burn twice the coal for half the heat; they accept plagues of rats or of vermin as acts of God; they deplore a stopped-up drain without making an effective complaint, because they are afraid of being told to find new quarters if they make too much fuss. If they could or would take concerted action, they could right a great many of the smaller grievances. But, when all is said and done, these reforms could do very little as long as most of the present buildings exist at all, or as long as a family of eight persons can only afford two, or at most three, small rooms (38). But nothing is more horrifying than how she cross-references housing conditions, particularly the cheapest basement flats, with the babies who have died. So many babies died. More than lived, for families in basement flats. They wanted to only study healthy families, but had to accept asthma and other pulmonary complaints as almost universal. 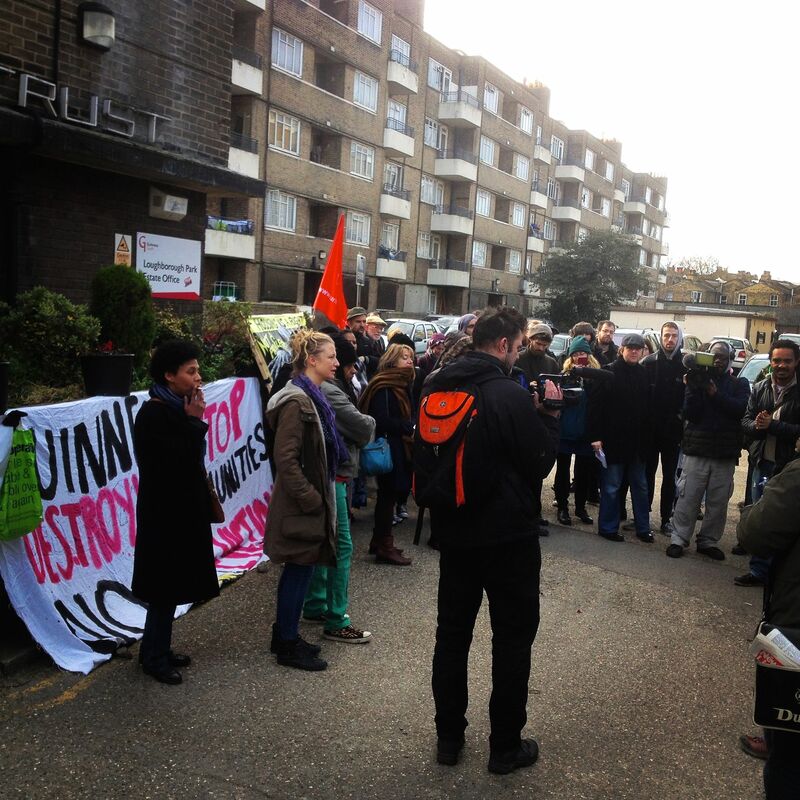 So fights are on across London to save council housing and to build more — folks from the Radical Housing Network and Lambeth Housing Activists among others, and prominent banners proclaimed the fight in the Aylesbury Estates and Guinness Trust’s Loughborough Park Estate. It’s not just housing, we all know libraries are on the cutting block this year, and the Save Earl’s Court folks were here too protesting the budget that is destroying the social fabric of the city. The occupation down at the Loughborough Park Estate has already been covered by the Buzz over the last few days, both management’s attempts to smash up the occupied flat to make it unliveable, and the ongoing protests every morning at 9am. While much has been won, and the occupation is at an end, the struggle continues to win secure tenancies in Brixton for the tenants. There were a handful of people in the evening as I joined them, half of them residents, the room dominated by the chatter of kids colouring and playing. A table full of food was in the other corner, and there are now lights and warmth and a working toilet. 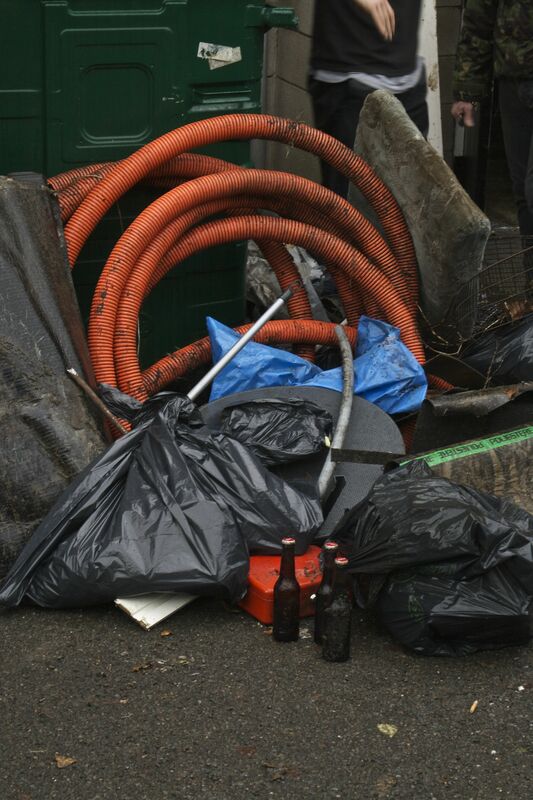 This was a space of protest and a place for residents to meet together and get support from the wider community. Since they moved in — up to ten to eleven years ago now — the Guinness Trust has denied all use of the Loughborough Park Estate community hall to shorthold tenants. I talked to Helen, an assured shorthold tenant (an AST) and one of around forty long-term tenants with shorthold status being displaced by Guinness Trust’s redevelopment plans. A musician with Yaaba Funk and other groups and a capoeira teacher (don’t know about capoeira? You need to find out more about this awesome Brazilian dance/martial arts mix invented by slaves), a filmmaker and artist, it isn’t hard to see she is one of the people that have made Brixton what it is. H: I’ve been here– I didn’t take this place over but I am a supporter—and they’re supporting me. I live just over the road and I’ve lived here for eleven years, so I might be one of the longest ones. I’ve been to the meetings, the radical housing activist meetings, so I knew it was a thought, I knew it was going to happen and it’s good, it’s a good little office. They’ve done this because there are so many people out on a limb, like ourselves who are literally going to be homeless, you know, we are literally going to be living on the streets, we’ve got no where to go. It’s a very difficult time. A very difficult time. Q: So can you give me just a little back ground on what is happening here, and with Guinness Trust? Helen: It’s been a long struggle, it’s been going on for a while, and we’ve been fighting for a while with people like the filmmaker Rashid Nix who used to live here. We’ve kind of known since 2011 or 2012, they started demolishing back about 3 years now– but bit by bit they’ve knocked down bits of the estate and then built it up and people have been, what’s the word? Decanted. With some people, you know, you’ve got your golden ticket, you’re a tenant and you get into one of the new flats. I’ve been into one of them and they’re really nice. But they’re selling some of them off as well, we know that now. Some tenants are still chatty and nice, they’ve got a completely different aura. They’re getting somewhere better to live. Our places are a bit knackered really, they need doing up. My boyfriend was asthmatic and it’s nasty with all the green on your walls unless you’re really handy and you’ve got to do it yourself, because they never came in once in 11 years. Lots of things have gone by the wayside because you know, let’s demolish it, let’s redo it. And there’s all sorts of classes here, it’s a complete class system. You know, you’ve got your tenants, who will be able to stay here, you’ve got your ASTs who are going to get a little pay off, you’ve got your Camelot who are groups of young people who get cheaper rent than what we’ve got and they’ll get a month or two weeks notice and then they’ll get put into another place to oversee and look after. Q: They’re the company that puts tenants in empty buildings aren’t they. H: They’re to keep people from squatting, to keep things like this from going on. Q: So you’re a shorthold tenant? H: Myself and Betiel, that’s what we are. Didn’t really have any way to change the tenancy, to get a full tenancy, to see a way to do it. Q: So basically Guinness Trust has been taking your rent for eleven years, without giving you the same status as other tenants? H: Yes. You know, a funny thing happened the day before yesterday, we were picketing and protesting and I saw this woman that I’ve known, she’s a tenant, and she came over and I suddenly realised she has been here less time than I have, and I thought oh my god! How did that happen then? So there’s not, there’s something wrong going on. She’s got a tenancy, she’s got a flat. Q: And what about the other tenants? H: Some of them are supportive, some embarrassed, some just don’t want to know. Q: What would it look like if you won? H: One of the flats [laughs]. But I don’t know, so many of my friends are gone now, they were ASTs and they’ve gone. Q: But were they able to stay in the area? H: Not all of them, some have gone to Hackney, some to Earl’s Court– It’s really expensive in Brixton, it’s very expensive here, there’s a complete – let’s call it gentrification, regeneration. As a person who has lived here eleven years I’ve watched it really change. I’ve watched the shops that were vegetable shops change to champagne bars and, you know, the whole sort of different feel of the place. Places where people lived for thirty years and have now been gutted, they’ve been thrown out, done up, and now you’ve got people who look like Prince Harry’s girlfriend who live there, to be honest [laughs]. Its not even Shoreditch, it’s like Chelsea, it’s very high end, I don’t know what’s happened, I mean, I’m living in it. I’m looking around trying to move and the rents are really high, I’m not sure what to do, I’m a part time worker, I’m an artist and a musician who works with kids. I don’t always earn that much money, so it’s hard. Q: So what can people do to support you? H: We’re just hoping to get people together in support, and it would be fantastic if we can actually change things. I just think it’s really wrong the way they’ve treated people. We all know the New Era tenants are awesome, so if you didn’t come down to see them at the Karibu Centre on Monday night you missed out on a good thing. Not because Russell Brand thinks so, but because these women are fierce and smart and inspirational. They have injected some hope into the struggle for the right of everyday people to continue to live in London, and a bit of much needed pride in being a resident of social housing. 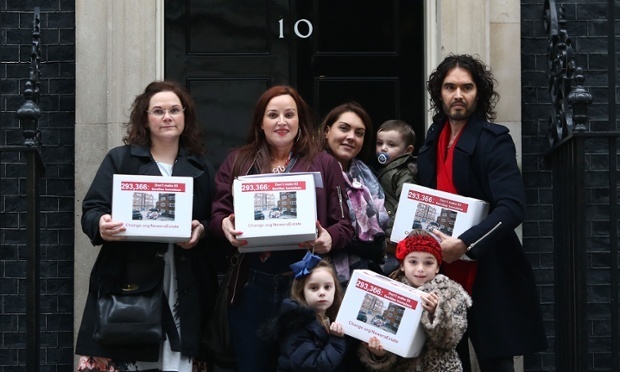 Russell Brand suggests New Era estate’s victory is the start of revolution: ‘There’s a little of this spirit in all of us and it’s beginning to awaken’…the New Era estate’s ‘victory’ represents ‘the start of something that will change our country forever’. Wouldn’t that be nice? Unite the Community Lambeth hosted the meeting, and Lambeth Housing Activists were there as well to build the momentum for the ongoing housing campaigns here in Lambeth. Their objective was clear, they knew that they were going to fight the whole way. The only way the company was going to get them out of their homes was to physically drag them and their children out of the doors. So much of this was about people being able to stick together. They worked hard to make sure everyone was up for it. They let everyone know exactly what was happening, putting leaflets under doors, holding meetings, posting notices on letter boards, talking over what these evictions really meant with other tenants. They created a tenant association, had house reps for each block, developed networks to keep people informed. They knew their targets — they sat and made a list of everyone who could be pressured, from the owners to the investors to local Councillors and MPs and Cameron himself. They were up for it. They looked for help and solidarity. 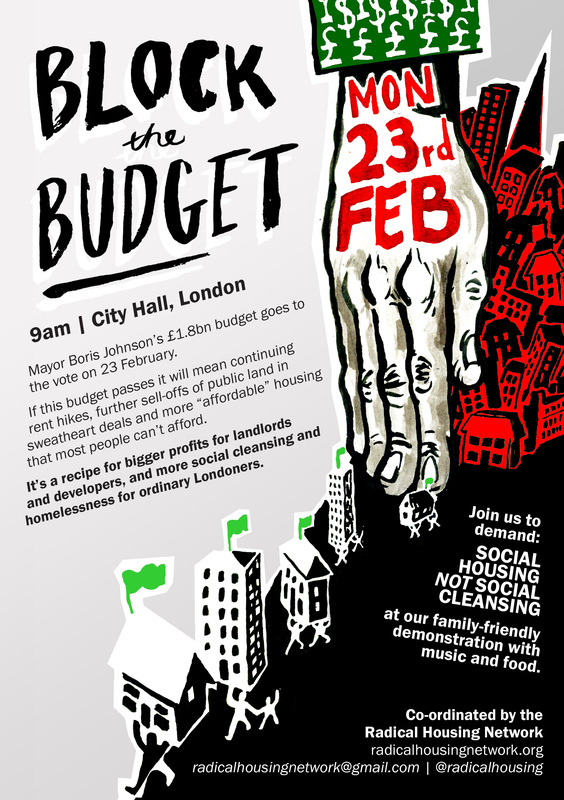 This came from organisations like Hackney Digs (doing some awesome campaigning around renters rights) and Unite, local institutions and businesses (schools and local shops and cafes and such), and of course the local and national press. Celebrities don’t hurt at all. They certainly brought inspiration to the hall. One of the key questions they answered was about how they managed opposition and apathy on the estate. They didn’t find much opposition, but a lot of people didn’t want to know or think about what was happening, just wanted to bury their heads in the sand. So a few key people had to take the lead, be the public face for the campaign. They spoke out, but never without letting absolutely everyone know exactly when and where and what was happening. The more people could see that they were making a difference, the less fear they had about joining in. Other tenants just didn’t believe they could win. Now, of course, they do. This still isn’t true of all the tenants on the Guinness Trust Estate here in Lambeth. Residents spoke out about the difficulties they are having keeping their own campaign momentum going as they face eviction due to regeneration. Calls for support will be going out as they continue their campaign. 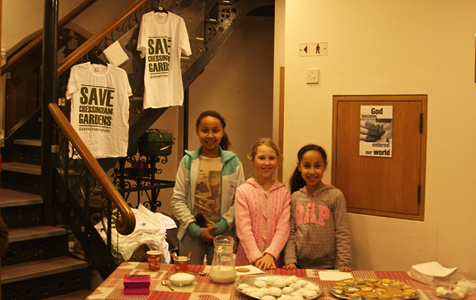 Tenants from the Cressingham Gardens Estate were also in the house, discussing their own ongoing campaign. 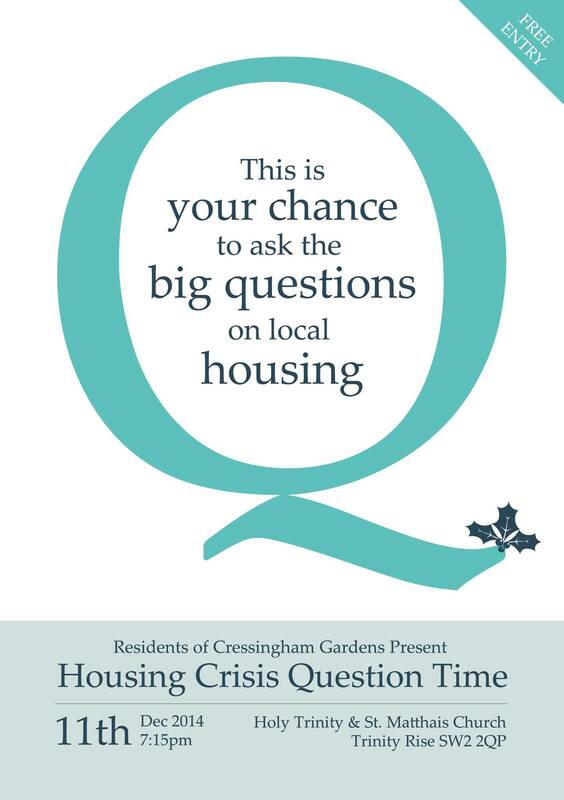 After a series of marches and a Question Time session with housing experts and local Councillors, on Wednesday they are returning to the full council meeting to present the Save Cressingham petition a 2nd time, because the council has failed to acknowledge the petition handed over by the resident delegation in December. 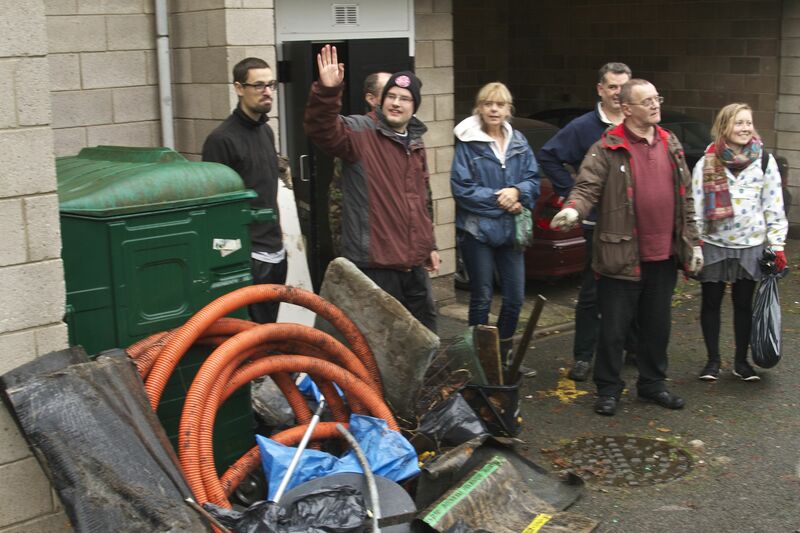 Residents of the Knights Walk Estate were also present, facing their own issues of regeneration. The other speaker of the evening was Adam Lambert from a labour campaign at St Mungo’s (you can read about their campaign here). He made the important point that as Housing Associations lose what ideals they had to become ever more like corporations paying their directors six-figure salaries, workers as much as tenants are getting screwed. They themselves are often tenants of social and other at-risk housing, and should be part of these campaigns as both workers and residents. An RMT member emphasised the similarities between councils running down housing in order to then argue that it is beyond repair so they can sell it off — another connection between work and housing. A number of people expressed frustration with political parties who refuse to put social housing on the agenda. There was wide agreement that bigger and broader actions and marches need to happen, people need to keep coming together. Tenants from New Era, workers from St Mungo’s and many of those present in the hall were all planning on attending this Saturday’s March for Homes. This is an incredible book that will move you deeply, even if the true meaning of home and the trauma of losing it hasn’t been burnt into you by life itself. As someone who has experienced eviction and poverty and loss, I confess I have strong feelings about how people write about it, document it, photograph it. But here it is done with a beauty, love, and respect that comes closer to capturing the many shades of what it means and how it is experienced than almost anything I have read. There is no sentimentalization here, no glorification of the working class or a home that after years of landlord neglect has become much less than anyone would wish. Instead it is a deeply felt exploration of meaning from many angles, a teasing out across perspectives, a contextualization of loss and change through words and images and theory. My favourite section is the first one by Andrea Luka Zimmerman and Lasse Johannson, the experience of living on Hackney’s Haggerston West Estate and watching it slowly emptying of people, introducing the incredible series of photographs from Haggerston and Kingsland Estates, with captions that add another level of depth to what the images make so vivid. I took the photo that heads this review in 2011, wandering down the Regent’s Canal and finding it beautiful and extraordinary long before I met Andrea and Lasse or heard about their work. Followed by a more literary piece by Paul Hallam, exploring estates in the plural and the singular, winding around the meaning and making of place and poverty, extracting quotes from residents that I confess made me shed a tear or two on the tube. 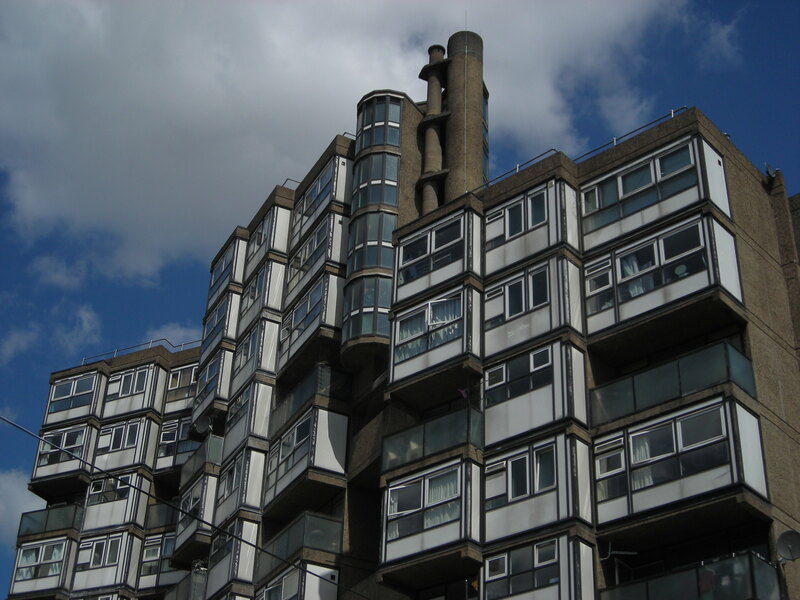 There is much to ponder in Victor Buchli’s Archeology of the Recent Past, and a clear contextualization of the particular within the broader history of Britain’s social housing by Cristina Cerulli. They come together in a thought-provoking, moving whole. No one can ever have the last, the final, the entire say of what estates mean to those who live in them, what it is like to live in them, what it is like to lose them. That is the point. Estate is simply a gift to those who read it, the gift of a view, a taste, an experience that will make you think and feel deeply. an artist’s film, song cycle and installation to be created and performed by the disappearing community of the Haggerston Estate. It is the final and most ambitious project in a trilogy of collaborative works on the estate led by artist resident Andrea Luka Zimmerman, working closely with architectural researcher and writer David Roberts, following the public art/photo-installation i am here (with Lasse Johansson and Tristan Fenell) and the artists’ book Estate (Myrdle Court Press, with Lasse Johansson, Paul Hallam, Cristina Cerully, Victor Buchli), both of which have gained international acclaim. 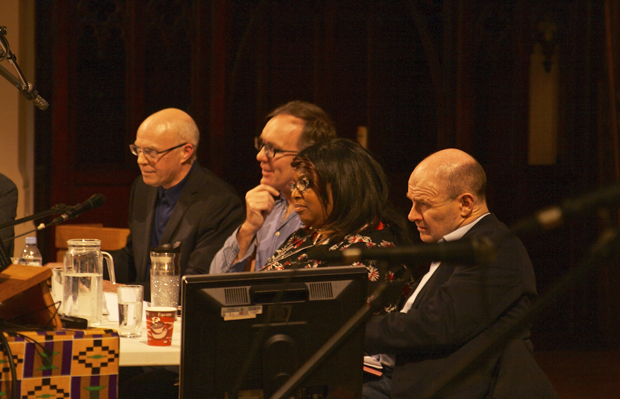 The Question Time session on housing and regeneration in the borough last night, hosted by residents of Cressingham Gardens and the Holy Trinity & St Matthias Church, was quite brilliant. I think this is at least one of the things democracy looks like. On a panel chaired by Dave Hill (sitting in the centre above) from The Guardian were, from left to right, Jonathan Bartley of the Green Party, Michael Edwards from University College London, and Cllr Matthew Bennett (Gipsy Hill and cabinet member for housing) and on the other side of Hill, Chris Brown of Igloo Regeneration, Cllr Marcia Cameron (of Cressingham Garden’s ward), and Dr Paul Watt from Birkbeck University of London. You can follow the live blog from Single Aspect, with a lot more detail through the second half that I had to miss. I didn’t quite catch the first question from Judith as I was taking pictures, but it was a general one on housing and the council’s commitment to social housing. It just gets worse every time I hear the statistics. So what are they doing? Bennett stated that their benchmark for regeneration schemes is that there is no reduction of social housing, only an increase. He mentioned a draft of regeneration principles on Lambeth’s website, but a google search doesn’t turn them up easily. He mentioned the Somerleyton development of course, I applaud the fact that it will provide around 100 genuinely affordable flats, the only genuinely affordable flats now being proposed in the massive development of central Brixton. I have no idea where the other 900 he says that Labour hopes to build in the next five years are to come from. 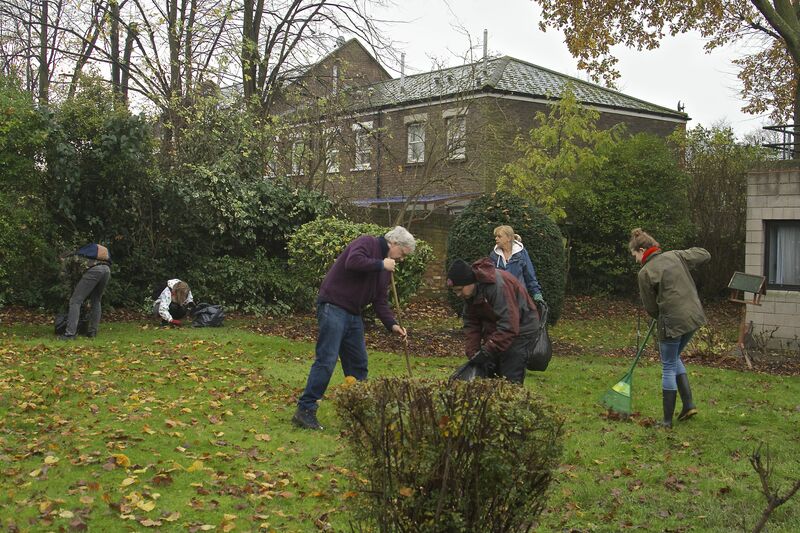 Bartley from the Greens was quite vociferous in defense of the Cressingham Garden tenants. He noted that after going over the accounts, the number of units of social housing has dropped from 29,000 in 2006 to 24,000 today. Only 1000 of those have been lost through right to buy, the rest are gone through stock transfer, regeneration and demolition. And then there was Cllr Marcia Cameron. She was the only woman on the panel, and the only person who wasn’t white. I think a little more thought should have been taken on that, and I wanted to be supportive but she made it really hard. 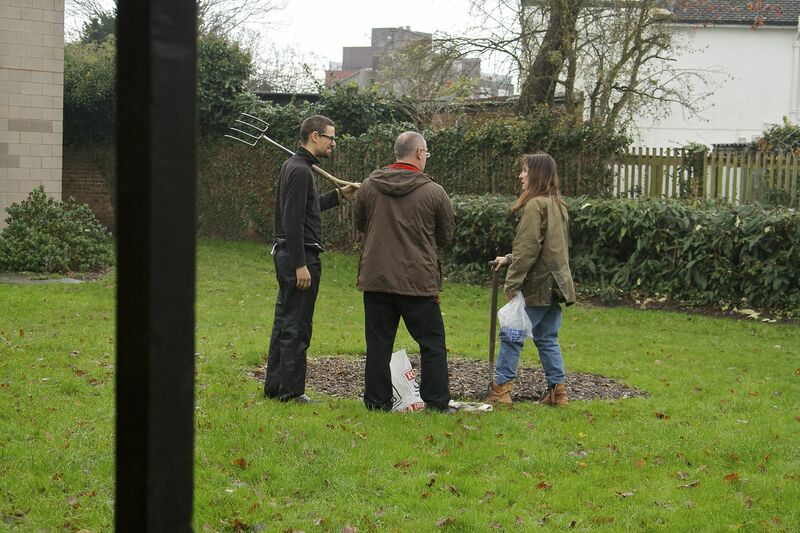 When asked why she supported the regeneration of Cressingham Garden she was open about having initiated it. Her story is that tenants came to her saying the property was unlivable, so when funding became available for regeneration she saw it as an opportunity to put the estate forward. Tenants in the audience didn’t appreciate that at all, but she never dropped that line of argument. I don’t know how we can be thinking of the same estate. Another question noted the number of vulnerable people living in social housing and asked how they were measuring the impact of regeneration. Dr Watt talked about the devastating impacts of regeneration, a long and drawn-out process proceeding over ten to twelve years, and people not knowing will happen to them and to their homes suffer sleepless nights, anxiety, worry that builds and steadily builds. Regeneration produces sickness. Cllr Cameron made a slight miscalculation I think, trying to claim that leaseholders and social tenants were divided on the issue of preservation with social tenants being in favour of regeneration to obtain repairs. Probably unaware of how many social tenants from Cressingham Gardens were actually in the audience she asked them to raise their hands almost as a challenge, and a whole lot of hands went up. Awkward. She clung to the line that how health was impacted when people live year after year in properties in disrepair. The hall erupted then, laughter, anger, disbelief. Because Judith had already captured the generally shared sentiment of the audience earlier, when she replied that it was a bit duplicitous of the council not to mention who was responsible for repairs to social housing in the first place. Cllr Bennett urged us to remember how stressed and anxious all those people on the waiting lists are, just like all those without homes. He seemed to imply a selfishness of the few wanting their homes to remain as they are. This raised one of the key questions for me, what do Labour think they stand for? Do they really think these deals with developers to build more market rate housing is the only possible to maintain the social housing we already have, much less build new? How did they get into this box around their thinking? I understand they are in a really hard place with the coalition in power and the drastic budget cuts, but surely this was the point a real opposition party would have put forward a different platform for dealing with the housing crisis. I heard nothing of a real alternative, absolutely nothing, it’s private developers with their market rate housing (and their driving up of rents and land values across the borough) or nothing. A concrete plan for building 100 units of social housing and a goal of 900 more over five years is better than nothing, but not so much different than nothing given the numbers that the Cllr Bennett himself rolled off: 21,000 people on waiting lists, 2000 without homes at all…what are they doing? I almost felt sorry for them, as clearly there is no party line on actually building the housing we need. Dr Watt kept saying over and over again, the regs governing regeneration are too loose, you never know what you will get as everything changes over the many years these projects drag on with changing councillors and development partners. But he is unaware of a single project able to actually provide more social housing than existed before it started. Generally, social housing is lost. The Councillors had no real response to that, nor to the question from Bill about the larger context for this regeneration, either, which is the privatisation of land and rent, the drive to eradicate social housing. He made the point they had to choose where they stood on that, but they didn’t. This in spite of going on and on about process, workshops, tenant democracy. Ultimately it will come down to money and political will. I’ll end on the situation of another large constituency in the audience, residents and former residents of the so-called Short Life housing, cooperative housing that has cared for buildings that otherwise would have long ago have become totally derelict. 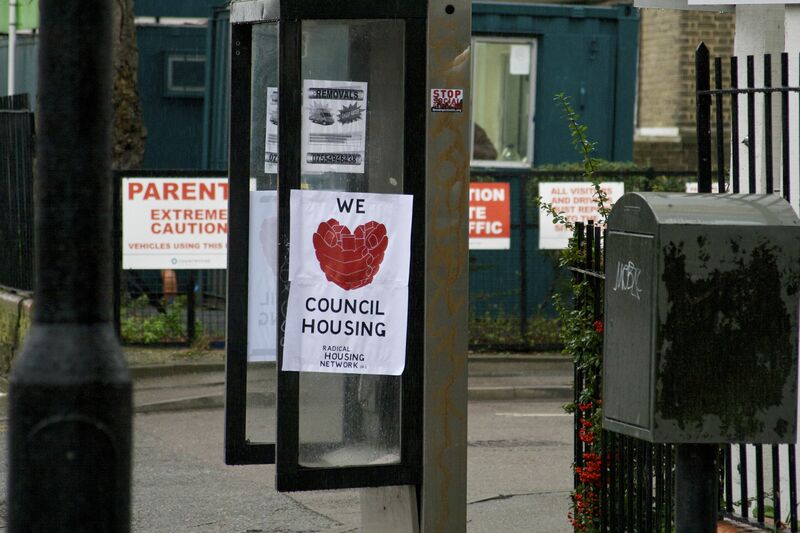 Promised by labour councillors that they would be supported in formalising their residencies, they have instead been involved in a long process of evictions, their housing being sold for millions. When asked about the council’s lack of accountability to former promises made to cooperative tenants, Cllr Bennett claimed that they were not social housing, had never been social housing. 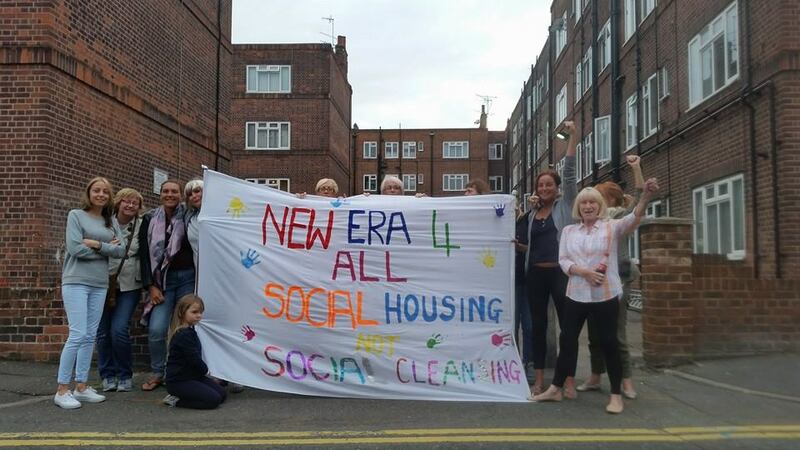 The response from the Lambeth United Housing Coop is that these tenants were on the list to receive social housing and believed they were in social housing when setting up the cooperatives. Their testimony was eloquent on the irrevocable loss caused by eviction, the damage to lives and to community that the council has inflicted — after promising them their support and praising their work in preserving housing. I left early, just as Cllr Cameron was once more going on about the derelict conditions and the place was in uproar. It’s frustrating to see such complete lack of vision or understanding of the broader dynamics at work here. These are problems being faced across London as the academic panelists made crystal clear. They also made clear that regeneration is not the answer, but very possibly part of the problem. Ultimately the fight the tenants of Cressingham Gardens, the housing coops and other estates have taken up is about the right of regular people to remain in Lambeth. You see a print of London in which St Paul’s Cathedral stands prominent, to show the power of God. Today, we see everywhere monuments to money. But this is an exploration of a period that fascinates me as much as it does Cordell, the early part of this century when for just a little while an alternative to both of those two visions unfolded as an ideal of constructing a society of equal citizens – this is the filmmaker’s journey through the city he grew up in ‘to map the life and death of London’s egalitarian dream’. I still find it hard to write about film, particularly a documentary so packed full of actual information I want to master rather than just emotion or spectacle. This has some great shots of the city and the modernist spaces created there, alongside information from architects and historians that I am afraid is mostly paraphrased here as I took furious notes. I miss the clarity of the printed page, a misplaced nostalgia I know, when compared with the ability to experience space through this medium, hear and see these wonderful architects speaking about their buildings and the ideals behind them even as we experience the physical spaces they created in a way that books just can’t manage. Anyway, where I am sure of a quote I put marks around it, I just didn’t have time to transcribe more closely. I grew up in the London of the 80s and 90s and it’s still my home. I’ve always been drawn to the excitement of its post-war landscape; concrete and brick textures, unadorned clean lines, neon glow and dark shadows. And most Londoners my age that I know feel the same – the modernist city is our landscape. Yet all our lives we have been told that the same urban spaces are ugly – symbols of a failed, arrogant technocracy. While we’re comfortable celebrating 60s pop culture, many people still hate the buildings of that time. Worryingly, while I had once thought that popular taste would catch up with the urban building of the 50s, 60s and 70s, it’s now under attack. Major symbols of that time are being destroyed – often with gruesome delight on the part of the wreckers. We urgently need to defend what is left before it is all gone. The film looks at a series of modernist buildings in chronological order, I think perhaps I shall just share the notes of my main impressions for each, as much of this was still new to me and I am treating it as an introduction more than anything. I am so looking forward to revisiting and reading more about those who built them. Part of the birth of the NHS, and it could not have come too soon! The architect was from Russia, Berthold Lubetkin, and deeply influence by the Russian Revolution he believed in the linkage between radical art and social progress. He believed that a new architecture could reshape society, whereas our previous architecture had only served to reinforce the split between rich and poor. South Bank was to be ‘new symbolic heart’, a ‘counterbalance to symbols of money and power facing it across the Thames’. I shall never be able to see it as anything else now, though I didn’t before. In the face of gloom and despair over continued rationing and hardship after the war, the South Bank Centre was built in 1951 with a ‘technicolor launch party for the welfare state’, festival and fun, open air cafes and an attempt to fuse Churchill’s heroic past and dreams of future. This was an effort to show how modern architecture could rebuild public spaces. I have only ever loved it at night when it is beautiful glowing in the lights (so many modernist buildings are their best lit up in the darkness), and of course when it appears in Dr Who, but now I shall remember the hope it brought to a post-war society starved of light and colour and all the food and drink you could want. One of the first modernist social housing schemes was also designed by Berthold Lubtekin, on the site where Lenin lived while in London hiding from czarist police. There was supposed to be a bust and monument to Lenin, but with the coming of the cold war, Lenin was buried under the central column of the wonderful central staircase. This was supposed to be ‘An El Dorado for the working class’. Amazing. His apartments were are all given equal weight in design, none better than others, everyone equal. Lubetkin’s slogan? ‘Nothing too good for ordinary people.’ He believed residents should live in a work of art, and that is what he tried to build for them. I do not want art for a few, any more than education for a few or freedom for a few. ‘We were trying to build heaven and earth, some of us’, said architect Oliver Cox, his utopian attitude in part based on his respect for Morris and the Arts and Crafts Movement.He and his colleagues critiqued the then modern style as being a bit arid, they felt that something had been lost in the idea that people could be enriched by design. I love thinking about people are enriched by design. This was designed by four other architectures in something of a rebellion against Alton East, yet whose inspiration was Le Corbusier (I find that surprising, but no mind). This western extension was more of a designed formal landscape dominated by massive slab blocks of concrete, a pattern of building ‘that would come to symbolise the welfare state’, but was never meant to. It was meant, again, to maximise views of Richmond Park and integrate the buildings into the landscape they were designed for. By the time they were building Alton West, however, Labor had lost the 1951 election. The recent hardships ensured that the Tories continued with the welfare state, but they abandoned the idea of a ‘coordinated egalitarian society.’ The LCC was forced to drop plans for building in wealthy park areas like Hampstead, Greenwich and Blackheath and to hand over sites to private developers, building social housing instead on previous slum sites. 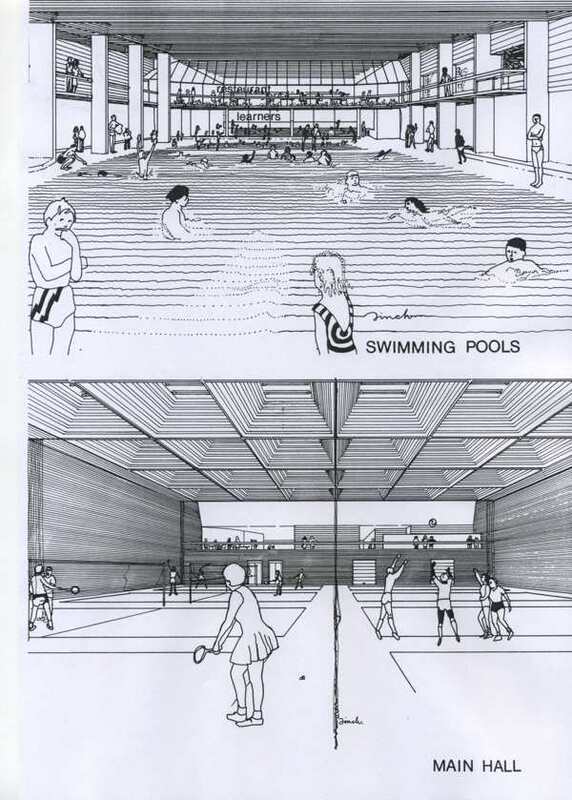 Thus there was no ability to move beyond designs for Alton West that had been developed for park sites, and these plans were simply reproduced in poor areas. Stepney and Brixton’s Loughborough Estate are examples, and this kind of building began to symbolise the opposite of the original architects’ and planners’ intentions. Instead of the utopian dream of a classless society, they began to symbolise the class divide itself, with concrete a new signifier. Thus East and West Alton still remain separated, with a class barrier even here. 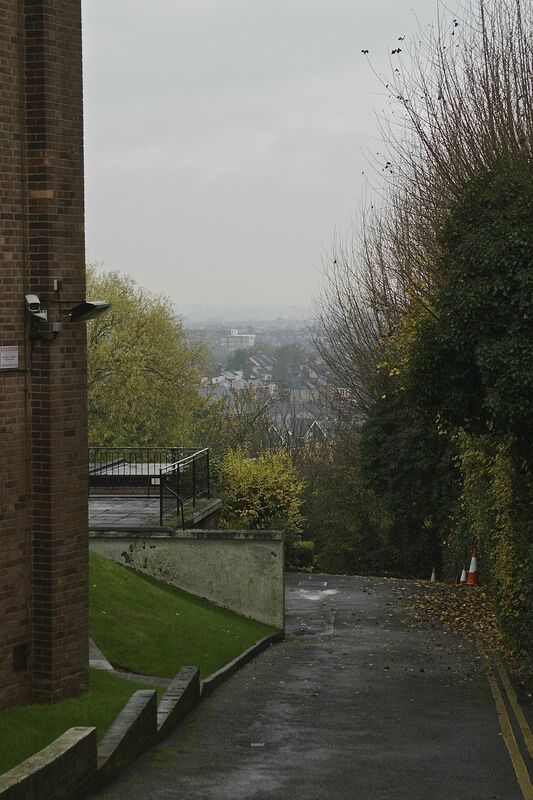 The Alton estate was also the site for much of the filming of Truffaut’s Fahrenheit 451, its architecture used to symbolise the dystopian. But I’ll come back to that in a later post I think. I have always loved this building, and always think of it as that wonderful estate where my friend Rosanne lives — fighting a long battle against steadily rising rents. Designed by architect George Finch, it contained doctor’s offices, a lunch club for pensioners, the registry office — this estate got the closest to what he wanted to do with his architecture, putting all things together into a block so it was interesting and lively and everything was close. This was in some ways a renewal of the old left vision in struggle with the consumerism of 1950s and 1960s, an attempt to make labour relevant again. The 1960s also contained the promise of technology making possible the dream of less hours, more free time, putting human contentment within reach. This alongside Finch’s belief that everyone deserves this kind of wonderful space, that everyone’s work is important to a society. So he built this place, and man, the views are amazing. He built eight more of these tower blocks to eliminate as much of the terrible slum housing as possible. In the paraphrased words of Elain Harwood, (architectural historian and author of forthcoming Space, Hope and Brutalism which I am definitely checking out) this showed Lambeth’s commitment to building housing in one of the worst slum housing areas. It represented Lambeth saying ‘look at us’, look at we can do. It makes you sick to see what they are doing now. The same Brixton Rec that is currently at the heart of a very different kind of development driven by a very different kind of council. One that has lost its conviction in the belief and social vision these buildings tried to make material: housing and public space as rights, not as assets. I didn’t know this development at all and fell in love, totally and utterly. It was designed by Neave Brown for Camden as a large development that would address some of the problems of 1950s – 60s building. It is a wonderful long terraced building, reminded me of pyramids with its splendid concrete and lots of greenery, or perhaps more of mountains. Everywhere has splendid views, and Neave says he was aiming to create a seamless building and ‘continuous public realm.’ I loved his notion of a ‘coherent seamless society’, one that doesn’t say that everyone is the same, but instead buildings are not simply the markers of status but in the reach of everyone and thus simply markers of difference and personal preference. They are just buildings you might or might not want to live in. What a wonderful world to aspire to. The pictures don’t do it justice the way video does as it takes you through the space and the changing, unexpected views. There is great footage of a woman who grew up there, talking about how she saw it as a big playground, its stairs strange and magical, full of secret places you could find and be alone in. While interviewing Neave you see children running up one of the concrete slopes, and Neave is delighted saying he designed it like that just so they would do it. It is wonderful, even if, as Neave reflects, it is a little too big and he didn’t consult people as he should have. Just before the big change in everything ushered in by Thatcher, we come to Kate Mackintosh, and her vision of humanised modernism. She found London very claustrophobic coming from Edinburgh, so to design Dawson’s Heights on a hill — she realised how special this sight was. Wanted to create a scheme that had unity, that grew out of the hill. She notes that there was almost certainly a ‘Castle image lurking’, and designed something that was imposing from the outside, but protective of what was inside and underpinned by cooperative ideals. She designed Leigham Court as well, which is another wonderful building Lambeth Council is trying to sell. So we come to Thatcher, there is footage from her celebration of the 12,000th council house sold. Local governments were required to sell council housing to tenants and unable to build new homes to replace them, rent controls were abolished, more rights to evict were given to landlords. There’s footage also of Professor Alice Coleman — a geographer who worked for Thatcher, and who argued that these modernist physical designs of council estates encouraged crime and anti-social behaviour. Her words were quite vile in comparing the ethic of council housing to suburban homes, attacking the buildings as much as the dreams behind them. The documentary ends with the loss of Pimlico School, an incredible modernist building also representative of the new visions for eduction. With funds long ago cut for its maintenance, the land was recently sold and the building destroyed to build a new academy. The architect John Bancroft was splendid in his rage at ideals betrayed. This film is just one more effort not just to save buildings, but to save dreams of equality, a struggle for a better society, homes that are safe and secure. Things worth fighting for. Lambeth Council and Lambeth Living are planning to close the Leigham Court Sheltered Housing scheme. 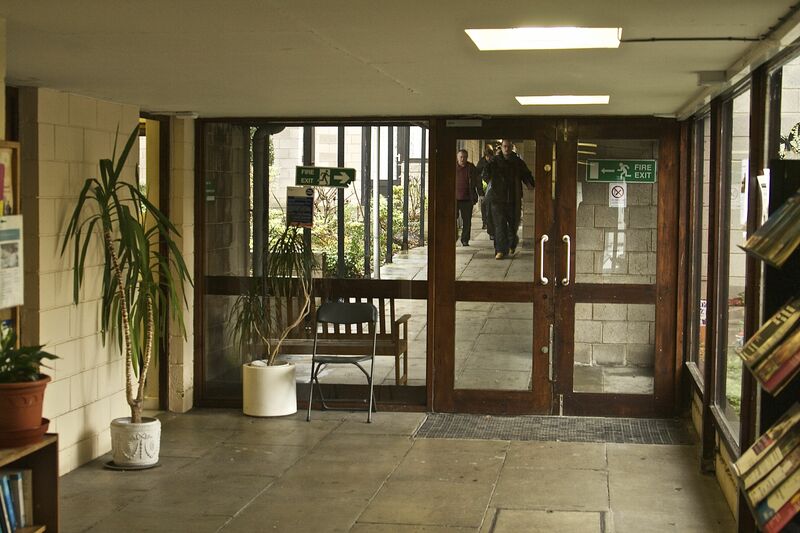 Senior residents have been informed that their homes will be demolished and the land sold off to pay for a mixture of extended care and private accommodation. Over the last few months, the residents of 269 Leigham Court Road in Lambeth have come together to campaign against the “disposal” of their community, which the council plans to sell to fund the construction of “extra care” housing elsewhere in the borough. 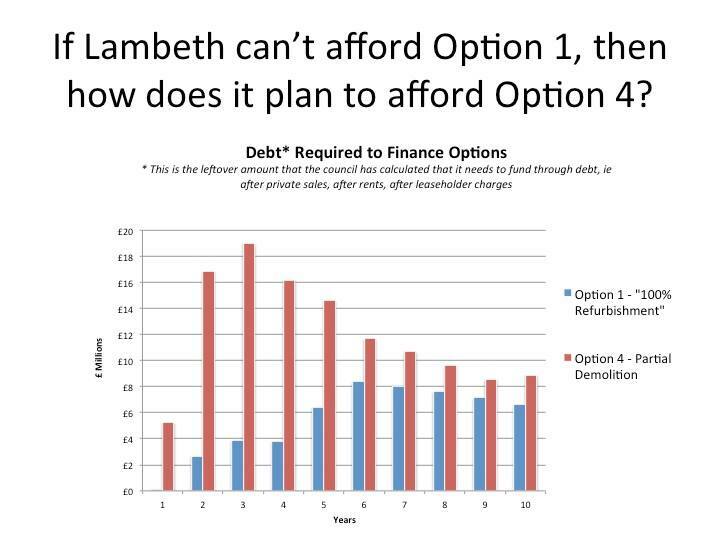 The drastic cut-backs in the national budget have set Lambeth Council scrambling rather than fighting, or even just effectively holding the dented shield and preserving as much as possible until there is a political change. So they have started selling off homes and public assets to finance services, evicting long term tenants causing incalculable pain, destroying the remaining footholds of current community members in rapidly developing and gentrifying neighbourhoods, and losing land forever to speculation and private interests. The so-called ‘Short-Life’ housing cooperatives that are now decades old, Cressingham Gardens (and more here), the Guinness Trust Estate, and Myatt’s Field regeneration plans are all additional examples of how much social housing is at risk or already lost. Perhaps this is because Labour’s position no longer seems to be much different on these issues, which is criminal, especially given the vision of both architects and the Labour government that built this housing in the first place. I realise writing this I need to do a lot more exploration of Blair and Brown’s housing legacy, and really read the new housing report being used by Labour to develop new policy. But on Lambeth’s own website, you can see that after the Leigham Court tenants voted to remain council owned rather than be transferred to social landlords, the council pledged to find funds for the renovation and upkeep of the estate. That was 2007, so what happened? 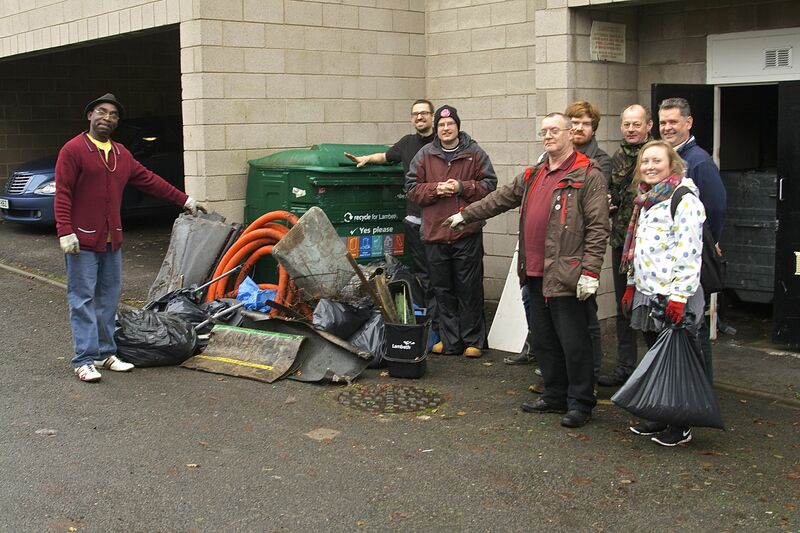 There were at least fifteen of us over the course of the morning along with local resident Valentine Walker, who can perfectly break down for you the council’s future plans, their reasoning, and the deadly conflict between community need and profit. I’ll be writing more about Leigham Court as I’m fascinated by this period of the mass building of social housing, this incredible commitment to creating a more just and integrated society, this utopian strain within architecture, building around people’s needs. This is, in fact, one of the key estates within this movement, with a fight on to get it listed by Docomomo. Apart from the Guardian article, the architect has also recently spoken on Resonance FM about the work to save the estate, and Leigham Court features in a documentary called Utopia London (directed by Tom Cordell), which I bought immediately and is sitting on my shelf as yet unwatched — even though a majority of the estates it looks at seem to be in Lambeth. So after getting to that I will be returning to this estate in more architectural and utopian detail. 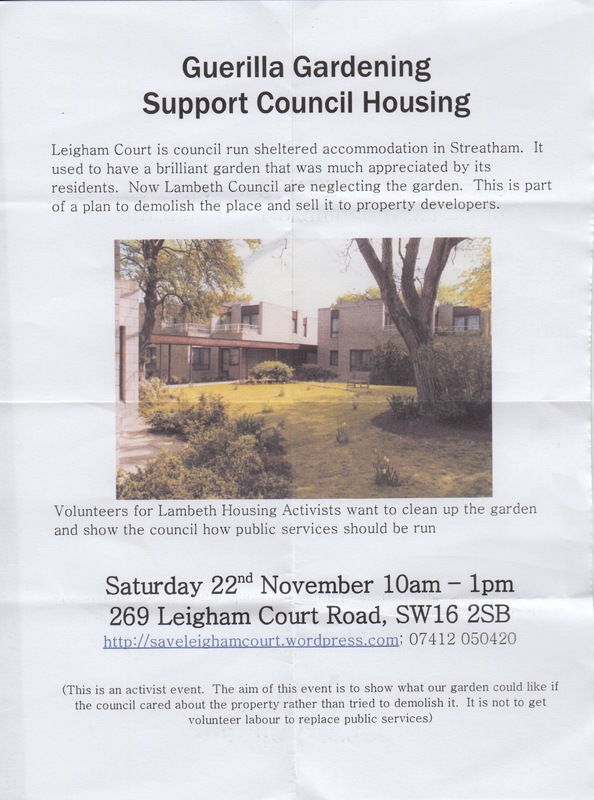 More articles on Leigham Court can be found on the websites for Save Leigham Court and the Lambeth Housing Activists.